Observed basking at a pond bank in Nairobi National Park, Kenya. December 2014. From Wikipedia: This very large fresh water turtle is found in tropical East Africa in lakes and rivers. 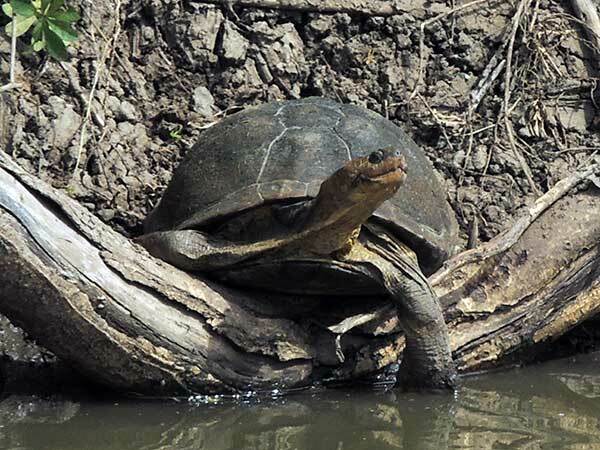 It can often be seen basking on logs, rocks or mud banks, or even on the backs of sleeping hippopotami. It eats water snails, plant material, and insects. It is the largest species in the genus Pelusios, with a carapace length of up to 55 cm. Females are larger than males. Males can also be distinguished by their slightly longer tails. For defence, the hinged plastron closes to protect the head and forelimbs, and the terrapin also secretes a foul odor when threatened.